As I sit down to write this, I'm not sure I can fit everything that I want to feature about Point Loma in one post. To my surprise, what seemed to me like one sprawling suburb is actually a real highlight of the city of San Diego. It is packed with so many things I love - history, architectural diversity, coastal views, repurposed building sites, shopping, and great food. Where do I even start? The beginning seems like a good place. Point Loma is where "California began" when Portuguese explorer Juan Cabrillo landed here in 1542, the first European to do so. A monument to Cabrillo stands on Point Loma, but for those that are less into dead explorers and more into beautiful lighthouses, I would recommend heading straight to the Old Point Loma lighthouse. The lighthouse was built in the 1850s, although its geographic location and the infamous marine layer rendered it ineffective not too long after that, and a new lighthouse was built in a different location. Fortunately for us, this beauty has withstood the elements and is open to the public. The simple exterior is complemented by an interior that is restored to what it might have looked like in the 1880s. And the star of the show inside? The mesmerizing staircase. So let's talk about the views. 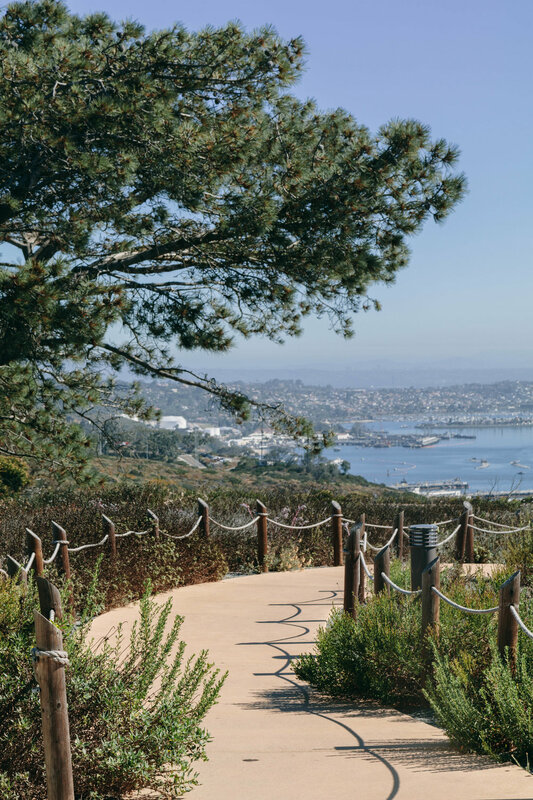 As a peninsula, Point Loma offers spectacular views of both the San Diego Bay and the Pacific Ocean. 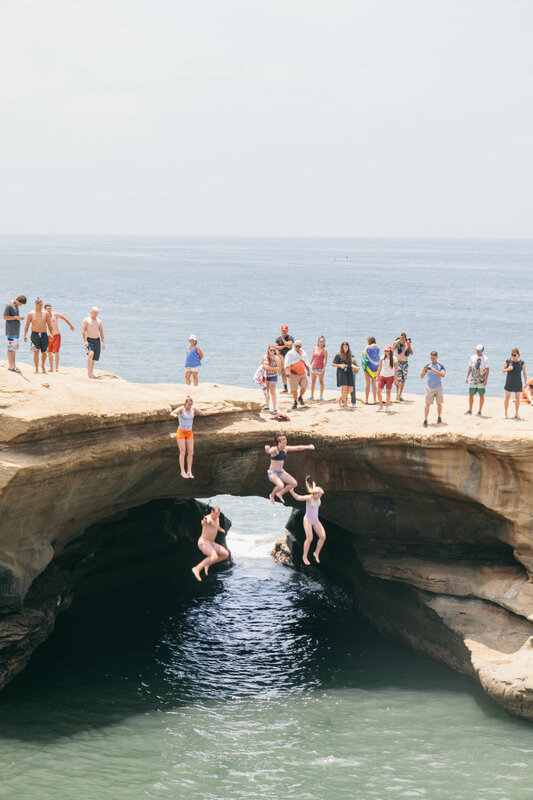 The Sunset Cliffs are named as such for the dramatic cliffs that drop to the ocean below (and, being westward facing, for offering that iconic sunset view). But since photographing sunsets isn't really my thing, I'd rather show you some of the daytime highlights of the area. 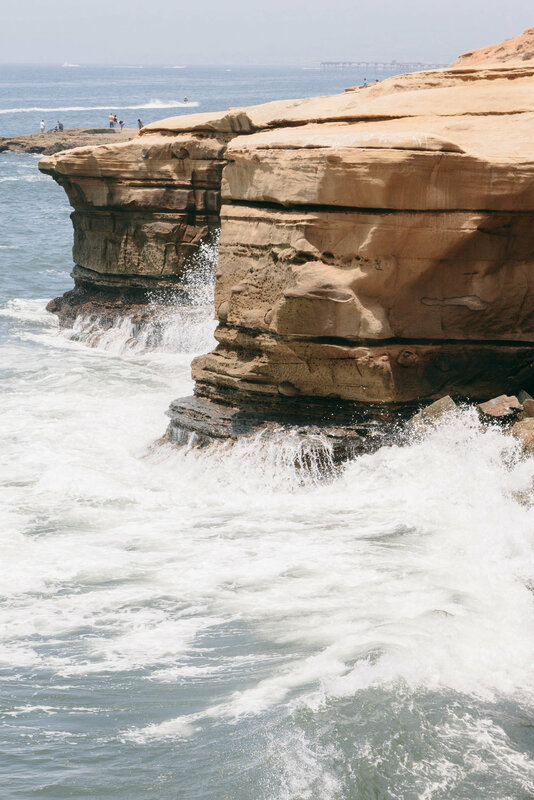 The waters off of Sunset Cliffs on Point Loma are well loved by the San Diego surfing community. A natural arch in the cliffs has become a popular spot for those brave (or crazy?) enough to jump from the top of it into the ocean below. This photographer doesn't necessarily condone such behavior (! ), but we did get a little adrenaline rush from watching them do it. 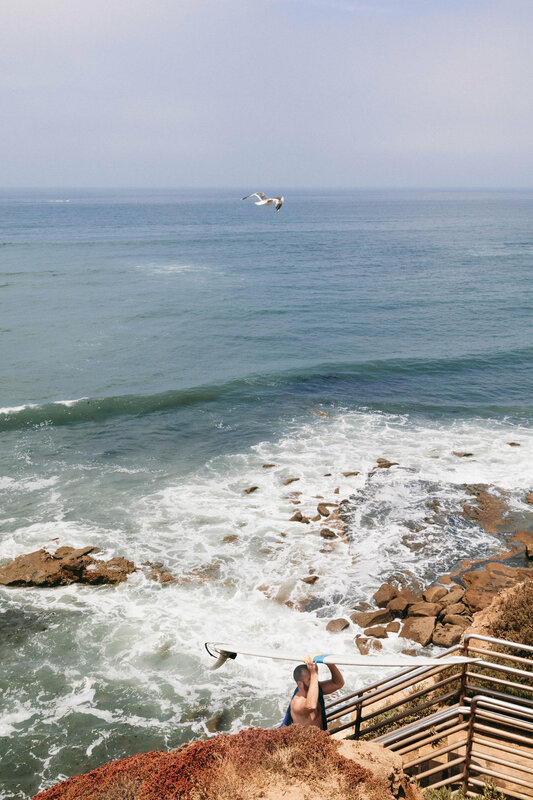 After all that surfer gazing and cliff jump viewing, there's no better place to unwind than Liberty Station. Once the site of a naval training center, the area now houses retail, event, and commercial spaces. The developers envision Liberty Station as San Diego's Town Square, and the urban planner in me gives them loads of credit for what they have done to achieve this. Repurposed facilities with open spaces, a diverse retail and commercial mix with entire sections dedicated to the arts - the future is promising as this site continues to grow. Here are some of my favorite spots (I really tried not to make them all about the great food that you can find here, honestly). And that leaves one last topic that I want to highlight (so far) about Point Loma - the historic residences. I will save that for another "See My City" post as it deserves its own space. And if you made it this far, you probably deserve a breather anyway, so I'll sign off for now.